This year the Cottage is celebrating ten years of being open to the public. As part of #10YearsofPLC, we’re bringing you various top ten lists related to Lincoln and the Cottage. This month, we focused on Lincoln’s commute, including a biking tour. Curious about what he would’ve seen? Here’s a comparison of then vs. now with the top ten things Lincoln saw on his commute. Before even getting on his horse to head to the White House, Lincoln saw the Soldiers’ Home Cemetery a few hundred yards north of the Cottage. The cemetery was created in 1861, and at its peak in 1862 (coincidentally right as Lincoln wrote the Preliminary Emancipation Proclamation at the Cottage), dozens of soldiers were buried a day. 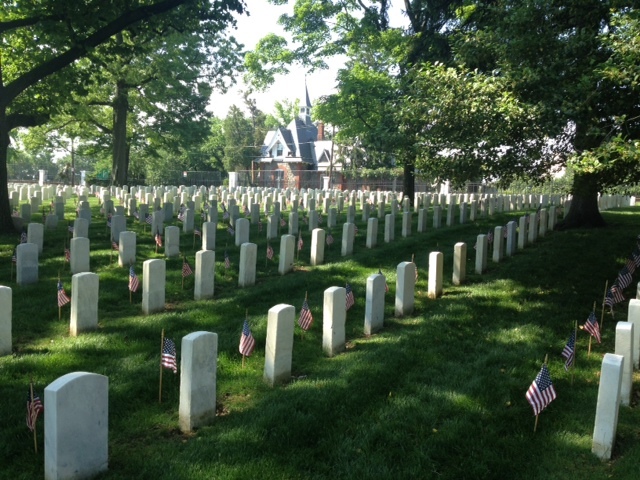 Today it is the oldest national cemetery in the country, predating Arlington, and is home to about 14,000 graves. In 1864, Lincoln was riding back from the White House, when a gun rang out in the night near the Soldiers’ Home. His horse, startled, galloped fast, and his hat fell off his head. Later, a soldier on guard, returned his hat — with a bullet hole right through the brim. Many scholars believe this attempted assassination took place near Randolph Gate of the Soldiers’ Home, which was then known as Ivy Gate. Today, the main entry to the campus is at Eagle Gate, closer to the Cottage. Ivy Gate circa 1870s. This was the main entrance to the Soldiers’ Home in Lincoln’s time. Modern view of Randolph Gate, which is south of the current AFRH entrance at Eagle Gate. One of the many hospitals that sprung up during the Civil War, Harewood Hospital was in operation from 1862-1866. It was located just south of the Soldiers’ Home, on land that was originally owned by William Corcorn — the business partner of George W. Riggs, who originally built the Cottage. 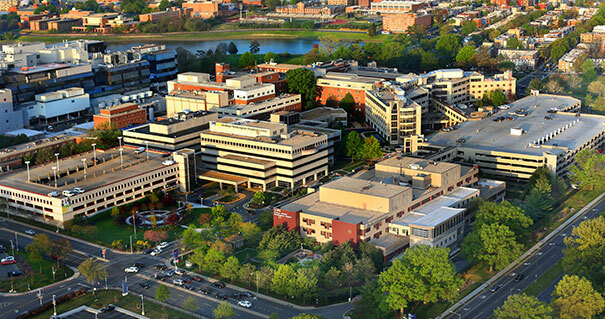 Today the land has continued its Civil War-era function, as three contemporary hospitals are on the same spot: MedStar Washington Hospital Center, the Washington DC VA Medical Center, and Children’s National Medical Center. Charles Mangus’s depiction of Harewood Hospital. Just to the left of the American flag is the main building of the Soldiers’ Home. In Lincoln’s time, the area north of Boundary Street (see next item) was more or less countryside, despite still being within Washington, D.C. As such, the roads, such as 7th Street Turnpike, could be dangerous at night. There were racetracks, taverns, and whorehouses nearby. John Hay once wrote in his diary that after being at the Cottage with Lincoln he “rode home in the dark amid a party of drunken gamblers & harlots.” Lincoln might not have seen these denizens of the night when he rode to the White House each morning, but he nonetheless knew what was out there. In addition, the neighborhood was not entirely unseemly, as there were several free black families that owned property near the 7th Street Turnpike. Today, this road north of Florida Avenue is known as Georgia Avenue, and is the anchor of the Petworth neighborhood as well as the eponymous Metro station. A snippet of E. G. Arnold’s 1862 map of the District of Columbia showing the 7th Street Turnpike extending from the city center in dark blue. The modern-day intersection of Georgia Avenue and New Hampshire Avenue, where the Petworth Metro station is located. The southern terminus for the 7th Street Turnpike (and location of the toll gate), Boundary Street was the original border between the City of Washington and unincorporated Washington County. Starting at this point, Lincoln’s commute into the city became much more urban. Today, it’s a bustling intersection in the heart of the Shaw neighborhood of D.C. Though it’s not much of a “boundary” anymore as both sides are urban, Florida Avenue does divide 7th Street from Georgia Avenue. This snippet of C. B. Colton’s 1860 map of Washington, DC shows Boundary Street in pink. The inserted arrow indicates where Lincoln would have paid his toll at the gatehouse. The intersection of Florida Avenue with Georgia Avenue to the bottom of the image and 7th Street to the top. In the wake of the D.C. Emancipation Act of 1862, thousands of African Americans came to Washington, D.C. to escape slavery. These formerly enslaved men women and children often lived in contraband camps throughout the city. Lincoln passed several of them on his commute, including Camp Barker, which by October 1862 had as many as 4,200 refugees. He once stopped at the camp and joined the residents in signing several gospel songs. Today there are no obvious visual signs of Camp Barker, though its location is roughly around the location of the Garrison Elementary School. Contraband Mary Dines saved this photo of Camp Barker as it looked around the time Lincoln visited. 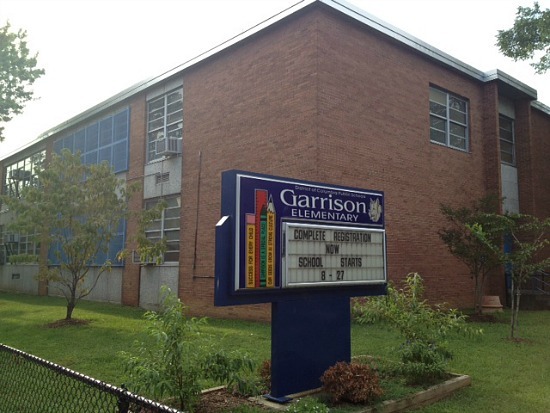 Garrison Elementary School, located in the U Street neighborhood of Washington, D.C. Camp Barker was likely nearby. From 7th Street, Lincoln turned down Rhode Island Avenue, where he soon came across Iowa Circle. Today that space is named Logan Circle, after John Logan who lived on the circle. Logan was a Union General who created Memorial Day after the war, and is in fact buried in the Soldiers’ Home Cemetery. Logan Circle today, with the statue of James A. Logan in the middle. The poet Walt Whitman moved to Washington during the Civil War, serving as a nurse. His first residence in 1863 was at a house at the intersection of Vermont Avenue and L Street. As he wrote in an August 1863 journal entry, he witnessed Lincoln’s commute daily. “I see the President almost every day, as I happen to live where he passes to or from his lodgings out of town. He never sleeps at the White House during the hot season, but has quarters at a healthy location some three miles north of the city, the Soldiers’ Home, a United States military establishment. I saw him this morning about 8:30, coming in to business, riding on Vermont Avenue, near L Street.” Today Vermont and L is the location of a restaurant named after Abe. Starting in the 1810s, some sort of hotel has existed at 14th Street and Pennsylvania Avenue. In 1847, Henry Willard leased several buildings at the intersection, creating his namesake hotel. Lincoln stayed there on the eve of his inauguration. In the intervening years it has changed ownership, lay vacant, and survived a fire, but today it is a bustling hotel a few blocks away from the White House. Located next to the White House, the War Department served as the headquarters of the Union war effort. As the only building in the city with a full telegraph office, it drew Lincoln’s attention. He often stayed late at night waiting for telegraphs from his generals stationed throughout the various theaters of the war. After the war, it was replaced by the famous Executive Office Building (today officially the Eisenhower Executive Office Building). 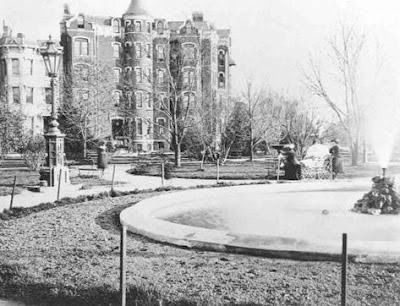 The distinctive building was constructed from 1871 to 1888, and initially was reviled due to its architectural style clashed with the more traditional buildings in the city such as the White House, Washington Monument, Capitol and other government buildings. The War Department as it appeared during the Civil War. It was Washington’s only telegraph office, and thus Lincoln spent a lot of time there waiting for reports from the front lines.